MITZPE RAMON, ISRAEL–Wooster senior Steph Bosch is a double major in archaeology and geology. Rather than do a joint Independent Study project, she is actually doing two theses, which will no doubt be challenging this coming academic year, but she is more than a match for the task. 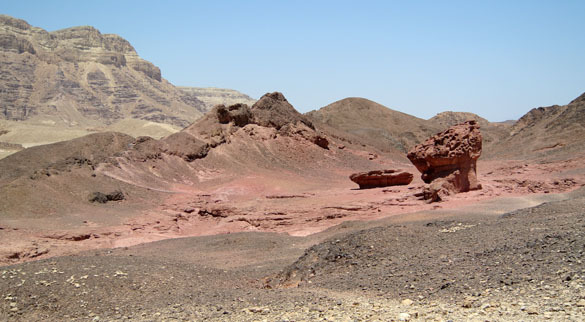 Because of her interest in ancient mining, after our trip to Eilat we stopped by Timna Valley to look at some of the oldest mines in the world. Here she is inside a Chalcolithic copper mine at least 6000 years old. It was carved into the relatively soft Cambrian sandstone with stone tools, the marks of some of which can still be seen on the walls. (Elyssa Belding Krivicich will remember sitting in that same place for a photograph back in the day!) I am amazed we could crawl through a warren of these ancient mines, but then the surrounding mountains are riddled with hundreds that are well protected. The landscape is fascinating, especially for geologists. The Cambrian sandstone is colorful and easily eroded, producing hoodoos like these as remnants on an intrusive igneous rock substrate. That soft sandstone also weathers into natural arches, two of which you should be able to find in this view of the western wall of the valley. 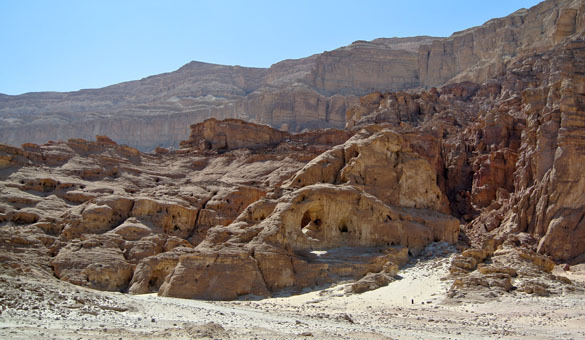 During the 14th through the 12th centuries BCE, the Egyptians had an elaborate and extensive mining and production system at Timna. 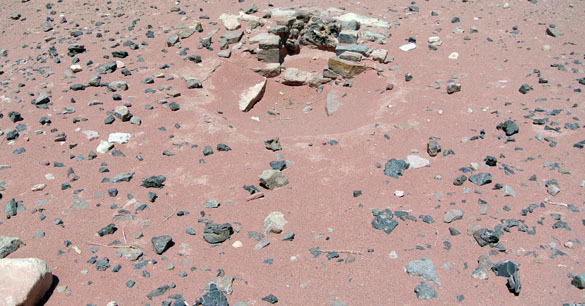 Here are the remains of a smelting camp where ore was processed to make ingots of copper. In this area is the smelter, a shrine, and a work building that had several rooms, each for a particular industrial purpose. The smelter is easy to find because it is still to this day surrounded by fragments of black, glassy slag, a byproduct of the process. 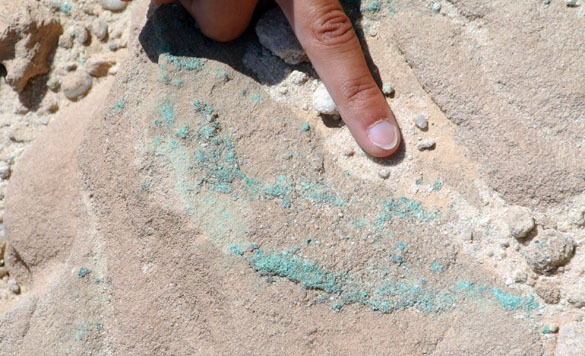 The copper ore itself is easily seen as green-blue veins in the nearly white sandstone. The sandstone is very porous (it apparently represents the cross-bedded deposits of ancient braided streams) and is easily penetrated by hot waters generated by magmatic activity below. It appears to me to be the copper silicate mineral Chrysocolla. Timna was a great place to look at the intersection of geology and archaeology. MITZPE RAMON, ISRAEL–It is a tradition for Wooster Geologists in Israel to have a day trip on Saturdays (Shabbat) to places of geological and paleontological interest. 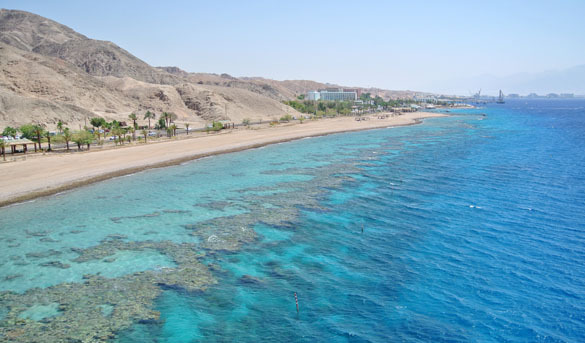 This year we choose to go two hours south to the city of Eilat on the tiny Israeli coast of the Red Sea. We visited the Underwater Observatory Marine Park with its observation tower that extends above the sea for a view of the coastlines of four countries (Egypt, Israel, Jordan and Saudi Arabia) and below sea level for a glass-enclosed experience with the fish and corals. It was plenty warm, and the humidity was a bit of a shock after a week in the desert, but the breezes were very pleasant. Above is, from the left, Oscar Mmari, Steph Bosch and Lizzie Reinthal. This is the coastline to the east of the observatory looking into Eilat. You can see the fringing reef in the shallow water. Unfortunately, as you may have guessed, most of the reef is dead or dying. Coral reefs are stressed all over the world with climate change (warming and acidification, especially) and pollution, but those in the Red Sea are in particular trouble. This is a narrow, busy seaway so pollutants are not easily flushed out of the ecosystem. For more on this topic, see the post from a visit in 2011. 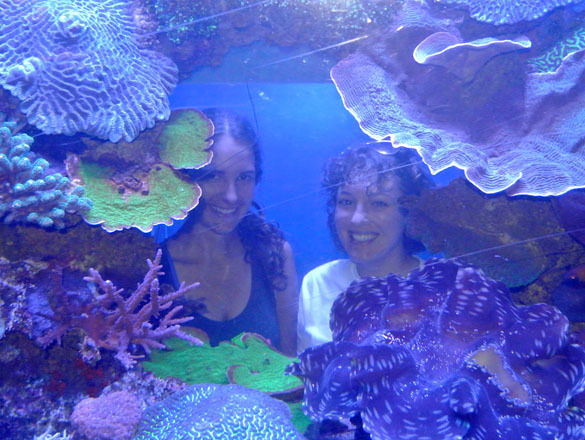 Steph and Lizzie, framed by the marine invertebrates we all love so much. 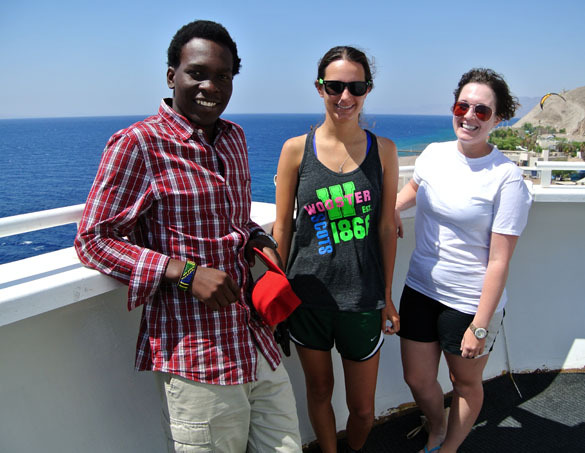 Our visit was much fun as we got to see many denizens of the Red Sea, including turtles, stingrays, sharks, octopuses, crustaceans, and many diverse reef fish. It was also educational as we could see many recent analogues for our ancient fossil communities.